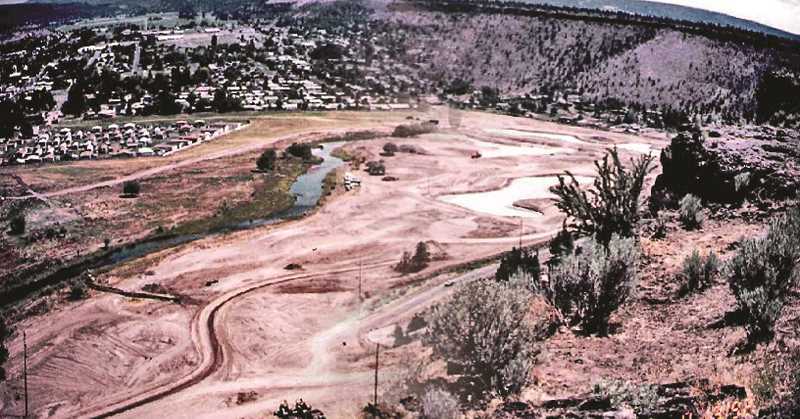 It was 25 years ago today — Aug. 14, 1993, to be exact — when Prineville's Meadow Lakes Golf Course opened for business, the result of an innovative and cost-effective decision that solved the city's wastewater treatment dilemma. Of course, there was controversy. "We took a lot of flak for it," recalled Henry Hartley, city manager at the time, who along with then-mayor Steve Uffelman were the main proponents of the project. "There was a lot of opposition from the citizens to the golf course. They thought it was going to destroy their rates." Sewer rates were far below the market, Hartley said, and they were going to go up. The only question was by how much. "We were under a mandate from EPA. We previously discharged (treated effluent) into the Crooked River, and they wanted us to cease that. So, we could do a mechanical treatment plant, or we could do irrigation," Hartley said. "The golf course turned out to be the least-cost way of taking care of the problem." At the time, many courses were irrigated with wastewater. However, Hartley stressed, Meadow Lakes was the first to be designed ground-up for that purpose. "Most courses in Oregon had to be drought tolerant," he explained. "Our golf course is a little different. It had to be able to handle a lot of water. It had to have a complete underdrain system to keep the ground water from rising to the level of the water that was applied, to totally avoid any contamination of ground water. It had a buffer zone around the river, to make sure you didn't get wastewater going into the river." Once online, the golf course received and naturally purified anywhere from 12 to 25 million gallons of treated wastewater each month, depending on need, according to Daren Holliday, the city's wastewater treatment plant foreman. Early on, Meadow Lakes sought to promote a country club atmosphere, and the restaurant offered full dinners and fancy buffets. Today, the tone is more that of a traditional public golf course that has proven popular with customers, according to the facility's PGA professional and manager Zach Lampert. "You think, 'OK, we're going to play a municipal golf course that has the lowest green fee in the area,' you might not expect much as far as quality. But when the golf course is in good shape, it's considered a good value. That's what we like to be." The course hasn't changed over the years so much as matured, Lampert observed. "The trees are getting bigger, and I think just the overall condition gets better with age. The trees are starting to change how the course plays a little bit." Lampert said they've removed a few bunkers that were rarely used to reduce maintenance costs, a fourth set of tee boxes were added to allow for shorter play, and one pond has been filled in, not so much to improve the game as to help with odor control. "We have gotten that (odor) under control much better here," he stated. "Steve (Reynolds, course superintendent) spends a lot of time spraying chemicals. (The problem was), algae would die, go to the bottom, and become sludge. We've really not had any smell issues the last couple of years." It's improved to the point that Lampert thinks the course could take on more wastewater than it does now, which only accounts for 50 percent of its irrigation, compared to 100 percent before the Crooked River Wetlands Complex went online in 2017. Holliday said that today the course could actually go with all freshwater, and the needs of the wetlands complex would still be met. That's not to say Meadow Lakes has outlived its utility. To quote current city manager Steve Forrester, "It's become one of the most recognizable assets of the city, and one of the best attributes of the community. It's part of who we are now." Lampert is proud that Meadow Lakes provides a good price for nonprofit fundraisers and that this fits in well with what the city wants to do to help the community. Already 10 fundraiser tournaments have been hosted this summer, as well as a half-dozen club tournaments. Last year, more than $75,000 was raised by charities through 375 donated rounds of golf. The golfing community's perception of the course has also changed. "Maybe in the past people thought of it as just the cheap course with the sewer ponds," Lampert said. "Now, people think of it as a really good golf course and the treatment part of it is kind of in the background." Golfers from all over frequent the links — currently nearly half are from out of town. Friendliness, customer service, and course condition are often cited as the draw. "My husband and I like to come out here and golf," said Vicki Thomas, from Bend, who was golfing with three friends. "The staff is absolutely wonderful, and the course is always in pretty darned good shape. And the price is right." "This is a course we love to hate," said Jay Echols, also from Bend. "There's only water on 16 holes. And then there's 16, which we term the 'hole from hell.' And of course, number 18 and 9 are always thrillers." Nevertheless, Echols said he plays the course at least three times each summer. Financially, Meadow Lakes is on an upswing from 2011-2012 when it "hit bottom," said Lampert. "It's been kind of a gradual rebound from that." Last year was tough, he said, because they had to close for more than two months due to snow, the Eclipse slowed down play, and all the late-season smoke cut into revenue as well. "You've got to take advantage of the good months and the good weather and hope that you have good controls in place to minimize any damage from weather stuff when the weather does go bad." Along with the 25th anniversary tournament held last Saturday, Meadow Lakes is offering a special rate for August of 18 Holes for $25 all day Monday-Thursday and after noon Friday-Sunday.